As the years have gone on, everyone now agrees that the majority of investigations have a digital element. Unfortunately, there are a lot of investigators who struggle to get to grips with the technical side of things and I know of dozens of occasions where some really simple digital forensics (such as metadata analysis!) would have pushed a case on, but it all got held up due to everything having to be sent to labs etc. As such, I decided to create some tools which would be easy to use and understand by all, with the hope of furthering front line capabilities. You've recently created Metadata Interrogator - tell us about the tool and what it does. I’ve found metadata invaluable throughout my career – it has given me invaluable intelligence in many cases, and singlehandedly helped close others. If anyone is in doubt (or wants a good case study) of the power of metadata, it’s worth reading up on the McAfee and Vice metadata fiasco! The Metadata Interrogator is software designed to extract any and all metadata from as many file types as possible in a way that’s easy to use and understand by all. It’s completely portable, works offline and provides analysis functions such as graphical timelines, offline geolocation and file comparison. Not only does it try to read the metadata, but it also tries to infer other information as well. Even if some of the metadata has been removed, there are still elements which, when put together, will help identify things like the device used to create the photo. Furthermore, the Metadata Interrogator was built with counter-fraud and law enforcement specifically in mind so helps highlight suspicious or anomalous metadata such as fields relating to image editing software. Whilst there are many tools available that extract metadata, I wasn’t able to find something that did exactly what I needed. For instance, many have geolocation to translate metadata coordinates into place names, but they all connect to the internet – which is no good from a security point of view. Mostly though, I just wanted something with a good GUI which would try and extract metadata from anything I threw at it. What feedback have you had so far, and what's new in the latest updates? I’ve had some really good feedback so far! It’s been great to know that people have found it useful. I’m really keen to get it out there, and for practitioners to give me feedback or suggestions for what they’d like to see. 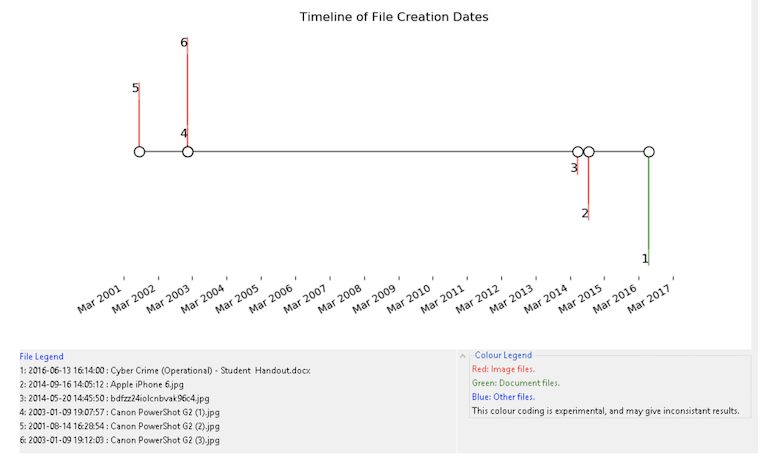 The newest update has a new graphical timeline (see below) and a lot of improvements to the file comparison and data set analysis functionalities. I’m currently in the process of gathering as many files as possible with metadata so that I can create signatures for what ‘normal’ metadata looks like from that device, which will hopefully highlight tampering on files even if it has been minor. I’ll also shortly be releasing Linux and Mac versions! You also run a digital document analysis training course - what does that entail, and what can students expect to learn from it? I created the Digital Document Forensics online course to give a really practical approach to digital document forensics (DDF) using tried and tested methodologies that can be used immediately in investigations. I wanted to create something that would be practically useful for ‘front-line’ investigators who are operating now, rather than just something which is a theoretical ‘nice to know’. That said, I’ve made sure that I don’t gloss over any of the needed technical or theoretical parts – no one likes receiving intel from someone who doesn’t know how they got it! Students can expect to learn how to analyse a wide variety of files/documents (especially Images, PDFs and Microsoft files) with the goal of uncovering any information which may help push on an investigation. They’ll also be trained in email header analysis, hashing/evidencing and writing a professional report of their findings. It was designed for those working in counter fraud, investigations and customer/user verification, and doesn’t assume the student has any pre-existing knowledge. You get a nice certificate too! If you’re interested, you can find the course here. In your opinion, what's the "next big thing" in digital forensics? I’d say the next big thing (although it is already upon us) is the so called ‘deepfakes’ – faked photos and videos which have been heavily edited but look pretty much indistinguishable from the real thing. This was once the preserve of very dedicated individuals and security services, but the technology around this has become something that can be used by anyone with a decent computer. I think the impact of this has been understated at the moment – let’s take the ever present paparazzi (as a small software creator I’m constantly being hounded by them) - what good would their photos be if you could easily create an absolutely believable picture of celebrity X doing heinous act Y? It’ll be like when Daniel Radcliffe (the Harry Potter actor) always wore the same clothes – eventually the paparazzi couldn’t earn anything by taking pictures of him as the pictures could have been taken at any time and showed nothing new. Obviously this effect will spread to hard news and similar, and we’ll need to think of new ways to digitally sign and verify media. When you're not working, what do you enjoy doing in your spare time? In the three and a half minutes a day I’m not working or sleeping, I obsess over making a perfect espresso and enjoy watching my favourite teams lose at ice hockey. Thank you for the chance to ramble on! I really do hope people find the Metadata Interrogator useful, and I’d love any and all comments and suggestions. Lastly, I’d like to put out a bit of a request – I’ve put the metadata interrogator out under the restriction of ‘free for personal use’. I’m happy for lone investigators, hobbyists and similar to use it to their hearts content. All I’d ask is that if you work for a big company and do find it useful (feel free to give it a try first!) then please get in touch before using it on a commercial scale. You can find out more about Metadata Interrogator and download a copy here.